Success! 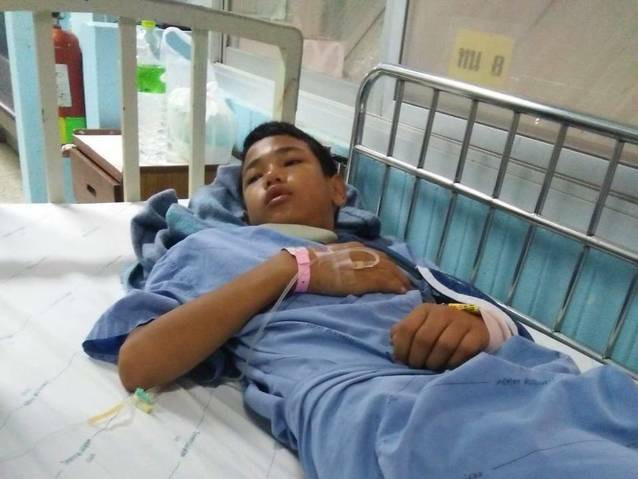 Nyi from Thailand raised $1,500 to fund fracture repair surgery. Nyi's treatment was fully funded on November 5, 2018. Nyi underwent fracture repair surgery. After surgery, Nyi no longer feels pain and can start moving his fingers. Nyi has started going back to school as he feels better. Nyi is a 13-year-old student from Thailand. He lives with his family in Mae Tao Village, Mae Sot Township, Tak Province. In his spare time, Nyi plays with the football that his sister bought for him. This month, Nyi fell on the ground and broke his forearm while playing football with friends at school. He was initially brought by his teacher to Mae Tao Clinic (MTC). The medic at MTC investigated him and informed the teacher that both bones in Nyi’s forearm were broken and that he would need surgery to fix the broken bones. Currently, Nyi is in pain and his left hand is swelling. He cannot move around and cannot even lift his hand up. With the help of our medical partner, Burma Children Medical Fund, Nyi will undergo surgery to reset his fractured bones and ensure proper healing. The procedure is scheduled for September 13 and will cost $1,500. After Nyi’s surgery, he will be able to lift his hand up, move around, and return to his school. Nyi's case was submitted by Bue Wah Say at Burma Children Medical Fund in Thailand. Nyi was submitted by Bue Wah Say, Project Officer at Burma Children Medical Fund, our medical partner in Thailand. Nyi received treatment at Mae Sot General Hospital. Medical partners often provide care to patients accepted by Watsi before those patients are fully funded, operating under the guarantee that the cost of care will be paid for by donors. Nyi's profile was published to start raising funds. Nyi's treatment was successful. Read the update. Nyi's treatment was fully funded.